With the midterms just weeks away and sexual misconduct allegations swirling around Supreme Court nominee Brett Kavanaugh, the political stakes are high for the junior senator from Texas. WASHINGTON — Just two weeks ago, U.S. Sen. Ted Cruz seemed to be having fun. An old friend, Judge Brett Kavanaugh, testified before Cruz and other members of the Senate Judiciary Committee and was on the cusp of locking down for conservatives what was once a swing seat on the U.S. Supreme Court. Cruz playfully teased Kavanaugh over the rivalry of their alma maters — Harvard and Yale, respectively — and he went on to praise Kavanaugh's judgment for marrying a Texan. But this week, hardly anyone in the GOP is having fun in the halls of the U.S. Senate. And if his reserved posture and measured words are any indicator, Cruz is as serious and grim about this controversy as anyone in the Senate. Kavanaugh had seemed assured to replace retiring Justice Anthony Kennedy on the high court as late as last week. But California professor Christine Blasey Ford since emerged with explosive allegations that Kavanaugh sexually assaulted her when the two were suburban Washington, D.C., high school students. Momentum for and against Kavanaugh's confirmation ebbs and flows by the hour, as nasty memories of the Clarence Thomas hearings hang over how the U.S. Senate sorts out these allegations. And the midterms are only seven weeks away, with an expectation that white suburban women could be the deciding factor in races across the country. "It’s not an October surprise, [only] because we’re not in October yet," said Houston attorney Beto Cardenas, who served as general counsel to Cruz's predecessor, Kay Bailey Hutchison. "You don’t want this to be a lasting impression when voters go to the polls." At the center of all of these storms is the junior senator from Texas. To be sure, plenty of senators are in the hot spot this week. Several moderate members are threatening to tank Kavanaugh's nomination over the allegations. And Cruz's Texas colleague, U.S. Senate Majority Whip John Cornyn, is also a member of the Judiciary Committee. 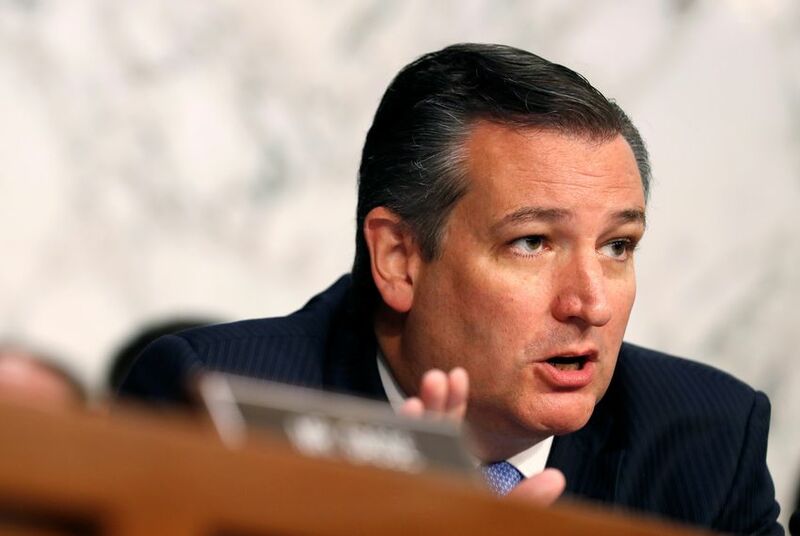 But Cruz is the lone member of that committee who has a competitive election in November, thanks to the restive and well-funded challenge from U.S. Rep. Beto O'Rourke, D-El Paso. And while reporters swamp these other senators as they roam the U.S. Capitol complex, the political stakes for every word Cruz utters are exponentially higher than nearly all of his GOP colleagues. On Monday afternoon, Cruz pushed even farther than his Texas colleague in calling for Ford to testify in public — rather than do interviews by phone, as Senate GOP leaders initially suggested. "These allegations are serious and deserve to be treated with respect," Cruz said in a statement. "Professor Ford should have a full opportunity to tell her story before the Judiciary Committee, and Judge Kavanaugh should have a full opportunity to defend himself. That hearing should be sooner, rather than later, so the committee can make the best assessment possible of the allegations." The biggest question surrounding Kavanaugh's fate is how the next week plays out. The Judiciary Committee was on track to move forward on the nomination on Thursday. Those plans were scrapped as the allegations engulfed the debate. Instead, Senate Republicans have called on Ford and Kavanaugh to testify before the committee on Monday. Reports suggest it is highly unlikely Ford will testify so soon. As of Tuesday afternoon, it remained unclear whether those hearings will occur. And should the Kavanaugh nomination fall through, the timing of a new nominee's confirmation process is highly uncertain. Most Republican senators are measuring their words when discussing Ford. Instead of thrashing her reputation, Republicans are directing their ire at U.S. Sen. Dianne Feinstein, D-California, Ford's home-state senator and the top Democrat on the committee. Ford sent Feinstein a letter outlining her allegations at the end of July. Feinstein said she did not release the letter in order to honor Ford's request for confidentiality. The letter leaked anyway late last week, sending the nomination into chaos. Republicans, including Cruz and Cornyn, have accused Feinstein of dirty tricks. They charge that she and her colleagues timed the letter's leak to upend Kavanaugh's confirmation at the eleventh hour. Compared to Cruz, Cornyn is playing much harder ball with the Democrats. Two weeks ago, he effectively threatened to expel U.S. Sen. Cory Booker from the Senate during the first round of hearings. And on Monday afternoon, Cornyn pointed the finger of blame for the drama directly at Feinstein. He reiterated those comments on Tuesday afternoon. “We wouldn’t find ourselves, nor would Dr. Ford find herself in this situation, if Sen. Feinstein hadn’t sat on this letter she’s had since July, said nothing about it during the course of the hearing for Judge Kavanaugh, and now raising it at this late date,” Cornyn said. Cruz chimed in on Monday, accusing the Democrats of "playing games" per the Dallas Morning News. But he has not actively sought out a role as a GOP spokesperson in recent days. Cruz's key moment will come on Monday, if Kavanaugh and Ford testify before the committee. "If I'm trying to envision his questioning of Ford on a panel, I would tell him to dial it down and focus on the process and not be a prosecutor," said Cardenas, the former Hutchison adviser. "I’d let other people take the lead on it." Female voters and candidates are proving to be a key demographic to the Democratic effort to take control of both chambers of Congress. Should Cruz not support Kavanaugh forcefully enough, he could alienate his conservative base. But pushing too hard to support Kavanaugh could turn off Republican female voters who are sympathetic to Ford and her allegations. The socially conservative base in Texas is holding the line for Kavanaugh. "Since he was announced we have been big fans of Judge Kavanaugh's, and that continues," said Joe Pojman, the executive director of Texas Alliance for Life. "We are very understanding that the Senate Judiciary Committee will have another day of hearings to address the allegations, but we remain confident that Judge Kavanaugh will be a very good justice on the Supreme Court." "This has happened very quickly," he added. "We haven't talked to our donors and supporters, but I will say not a single individual has called to ask us to reconsider our position on Judge Kavanaugh." Pojman remained confident that Cruz will carry the day in November, citing a new Quinnipiac poll that showed Cruz leading O'Rourke by nine points. Some sources close to Cruz suggest the drama offers a political upside: Democrats risk overplaying their hand and turning off independent voters; the somber tone Cruz has adopted presents a statesmanlike image; the hearings could motivate the conservative base; and the whole affair is an opportunity to show solidarity with Cornyn and other establishment Republicans. "Republicans in competitive races have to balance base support for Kavanaugh with the fact that women voters – especially college-educated women – are highly attuned to and motivated by gender politics since Trump’s election," said Anna Greenberg, a Democratic pollster. "This could further fuel turnout and Democratic margins for women in suburban districts, in particular." "I think it helps us tremendously if white women who lean Republican stay home," said Harris County Democratic Chairwoman Lillie Schechter, who oversees operations in one of the most pivotal regions in the state. "Our whole program here is talking to Democrats and likely Democrats ... It’s not driving them because they're already driven." Amid all of this controversy, the decades-old contentions surrounding the 1991 Clarence Thomas hearings roared back into the political conversation. Anita Hill, a subordinate to Thomas, testified that the future justice sexually harassed her while they were both employed at the Equal Employment Opportunity Commission. The all-male Judiciary Committee panel effectively savaged her character — and the wounds last to this day. As popular as former Vice President Joe Biden is among Democrats, he has since struggled to overcome the perception that he mismanaged the hearings as committee chairman. U.S. Sen. Alan Dixon would go on to lose his 1992 Democratic primary to U.S. Sen. Carol Mosely Braun, while a Republican on the panel, U.S. Sen. Arlen Spector, a Pennsylvania Republican, nearly lost his own re-election that cycle as well. U.S. Sen. Edward Kennedy, the Massachusetts Democrat who helped bring down the Robert Bork nomination, came under fire as well. Many Democratic women saw his own misconduct with women as the source of his restraint in protecting Hill from Republican attacks. Given the continued repercussions from the Thomas hearings, the historical significance of hearings on the Kavanaugh allegations— if they happen at all — is lost on no one in Washington. This time around, however, the hearings will take place against the backdrop of the #metoo movement that has ended the careers of a growing list of powerful men. During initial hearings earlier this month, Cruz apologized to Kavanaugh that his daughters had witnessed the "circus" of protestors interrupting the questioning. Two weeks later, the confirmation is more uncertain and far uglier, and the grim faces pacing around the Senate chamber reveal the toll this drama is taking. But Cruz's words to his old friend from that exchange still echo: "That is, alas, the world that is Washington in 2018." Marissa Evans contributed to this report.